This week StogieGuys.com is in Las Vegas covering the 79th annual International Premium Cigar & Pipe Retailers (IPCPR) Association Trade Show—the convention where cigar makers from around the world come to showcase their products and debut new creations. Check back throughout the day for updates, and keep an eye on Twitter for even more. Early Morning Update: Various cigar makers I spoke with all say that day two of the Trade Show was very successful, and that there was no noticeable drop off in sales from day one to two. It’s hard to say whether this was merely positive spin or actual sales, but it did seem that many more than a few booths were even busier yesterday. Everyone I spoke with was happy to back in Las Vegas (as opposed to New Orleans) and more than a few were a little worried about next year being in Orlando. 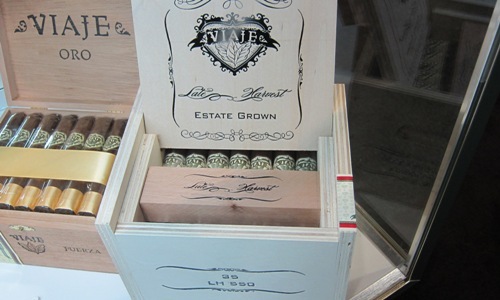 Yesterday I also visited with Andre Farkas of Viaje. He said he’ll continue to keep production low even though he has a waiting list of 150 shops who want to get Viaje Cigars in their stores. The next new release he plans is the Late Harvest. 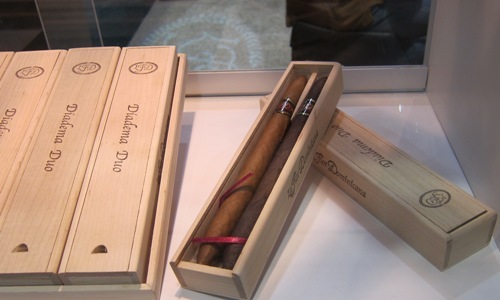 La Flor Dominicana is debuting the Diadema Duo, a pair of huge diadema cigars that will sell for $30 for the pair. Midday Update: Today is my last day on the floor, but I wouldn’t leave without seeing what’s new with Cigar Rights of America. 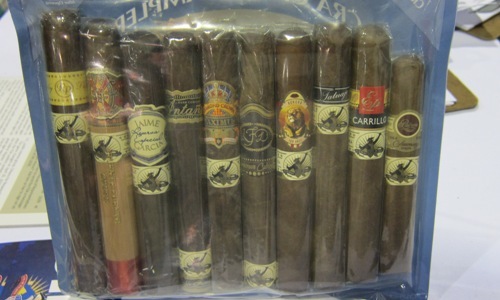 The group is launching a newsletter, with the first one due out soon after the Trade Show and also is putting out another sampler which features some very interesting exclusive cigars: a large toro-sized Tatuaje Black, an Opus X, and a new La Flor Dominicana Cameroon Cabinet Chisel. Check back throughout the day on Monday, Tuesday, and Wednesday for live updates from the Trade Show floor as we get the skinny on new products. And feel free to leave a comment on this post if you have a question you’d like us to ask a cigar maker. Any word on when the CRA sampler will be available to members? Looks amazing! CRA told me soon after the IPCPR. If you're already a CRA member you should get an email when they go on sale. That LFD Diadema looks like it would take half a day to smoke. What a great day that would be!